Claim space for your brand in every recipient's office or home. With branded gifts and giveaway items, a simple mug or hat can make a big, lasting impression. The big day calls for a big statement. And with years of experience, we can deliver that personal, meaningful style you want. As a hands-on, small shop, you don’t get lost in the shuffle or become just a number to us. We manage your project step by step to ensure it’s of the highest quality. We stand behind every piece of print. Our high-tech presses supply consistent quality. Both print and production are well organized, systematic and meticulously clean. For over 20 years, customers have trusted us with an incredible variety of projects at fair competitive prices. Design firms value our understanding of production as well as our practical suggestions. Small companies look to us for well-executed business packages. Individuals depend upon us to educate and guide them through the entire process. 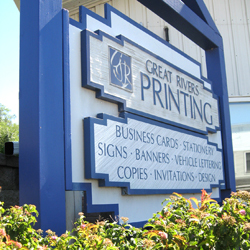 We can help you design and create a wide variety of printed materials to promote your business, announce a special event, or anything else you can think of. 8:00 am to 4:30 pm.